Border obstacles must go. That is crucial for both growth and employment. And important for the 2017 Finnish Presidency of the Nordic Council of Ministers, says the President of the Nordic Council, Britt Lundberg from Åland and Finland. Robots do not have a heart, so people are needed in workplaces in the future too. Britt Lundberg also promotes her own home place’s entrepreneurial spirit. She hopes the Nordic countries can learn from each other’s mistakes and successes. But budget cuts have made the Nordic cooperation more difficult. It has become harder to start something new, because you have to get rid of something old. People in Åland are proud of Britt Lundberg. Now she is the President of the entire Nordic region, wrote one of Åland’s newspapers reporting from the Copenhagen session. Åland has held the Presidency of the Nordic Council only once before, back in 1997. 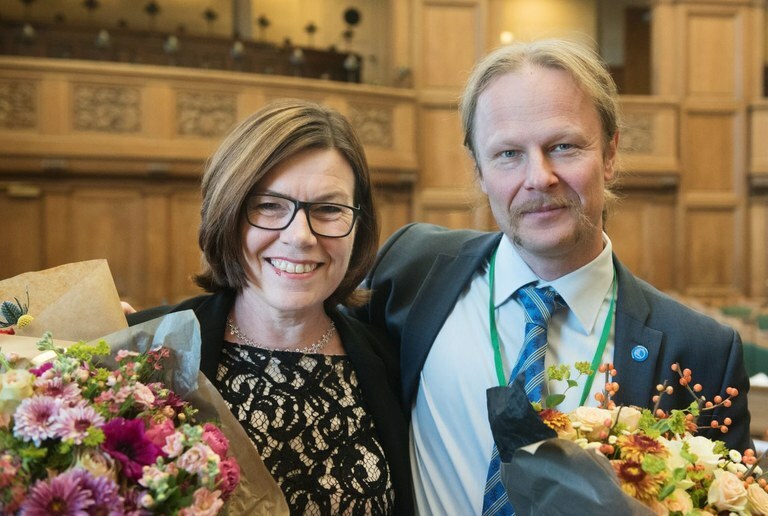 Britt Lundberg, of the Åland Centre Party, and Vice President Juho Eerola, of the Finns Party, in the picture below, head the rotating Nordic Council Presidency this year. That is not without controversy. But you have to separate party politics, national issues and Nordic issues, thinks Britt Lundberg, who is doing her best to stake a course between the underlying political disagreements. The main labour market topic in the Finnish Presidency’s programme is easy to spot: the cross-sector issue of border obstacles is all over the Finnish programme. “This is absolutely central when it comes to labour market issues,” says Britt Lundberg. It is about functioning mobility, and that is very important for further growth and increased employment. Britt Lundberg underlines that when it comes to retirement issues, there are variations in age, numbers and special rules between the five Nordic countries. People moving within the Nordic region must pay close attention, or they risk losing out on benefits like disability allowances. If you are considered unable to work in one country, it should be applicable in the whole of the Nordic region, believes the Nordic Council President. There are similar problems when it comes to education and degrees. Travel – but be prepared for differences! “We share many goals across the Nordic countries,” says Britt Lundberg. High employment rates and getting people into work is among them. Yet we still have fairly different approaches when it comes to social security systems. Complete coordination might be too much to hope for. But it is even more important that people who move take time to find out of and prepare for the differences. Britt Lundberg’s “own little hobbyhorse" is personal ID numbers, which could be shared across the Nordics. It would make it easy to enter all previous summer jobs into the systems, so that pensions could be paid out automatically when the time comes. Today it is hard to remember and to know which befits you might be losing out on. Within the Nordic region we are used to the similarities. But in the rest of Europe the Nordic model is considered to be unique. Yet it is not that well-known. A joint Nordic labour market since 1954 and the passport union. No legally binding minimum wage but a system where wages and other conditions are agreed upon by the social partners in a unique manner. “Thanks to the flexibility in our tripartite cooperation, we also get a labour market participation rate which is unique in the Nordic region compared to the rest of the EU,” says Britt Lundberg. Britt Lundberg likes Nordic mobility. This shows that you can look at the Nordic region as a joint labour market, believes Britt Lundberg. But we might not get much further than this. The idea of a Nordic federal union does not seem very realistic right now. There is desire for cooperation where each country makes its own decision, but no desire for a supra-national state. The personal ID number currently seems to be the limit of what is possible. “We might need quite a bit of time and debate before we are ready for this,” thinks Britt Lundberg. She has listened to many arguments against. Even one saying “we’d run out of numbers” if there was to be a joint Nordic system. It is unlikely that would happen, but you would have to agree on the order of the digits, as some countries start with the date of birth, while others start with the birth year. It can be hard enough to simply agree on that. How is the cooperation on employment issues and integration coming along? Britt Lundberg refers to Poul Nielsson’s report on the future of Nordic labour markets. She seems disappointed in the debate surrounding it. There was never a properly engaged debate, just some domestic sounding off from the opposition in the various countries, as Britt Lundberg puts it. “We have put pressure on our ministers of cooperation to stay in touch with each other on integration. If you cannot coordinate, you should at least inform each other about measures. This has worked well,” according to Britt Lundberg. But the different integration measures are controversial. Some argue for low-wage jobs, some want state subsidises for some jobs. It is quite difficult to draw the line for when authorities should get involved or not, admits Britt Lundberg. As a result, solving your country’s employment needs is seen as a fairly national task. There does not seem to be room for joint recommendations, according to her. Finland’s new trial with a basic income, is that something which could become a solution for the rest of the Nordic countries? The Nordic countries learn from each other. This is exactly how it works; someone does something and someone else is inspired. This also has economic consequences. But Britt Lundberg agrees that the Nordic cooperation used to be easier, when there was enough money to spend on all good ideas. Now the cooperation is focused on cuts. The Nordjobb labour market exchange programme for young people and the Nordplus financial support for lifelong learning has so far had enough money. Britt Lundberg is full of enthusiasm. Studying or working in the Nordics also bring valuable language skills. “It is an obstacle not speaking any Scandinavian,” says Britt Lundberg, who is from Swedish-only speaking Åland, part of a Finland where Swedish has been suppressed. The future of work is a difficult issue. The risk of developing a low-wage precariat, with people forced to have several small jobs to survive, has become a topic of political debate. The Nordic attitude is that we will not end up with an American model as long as the Nordic model lives on, with joint negotiations between the social partners. But you will always need manual labour, believes Britt Lundberg. Yes, to a certain extent you can talk about robotisation and automation of for instance legal and journalistic work. This is an issue which crops up more frequently in a Nordic setting. Britt Lundberg represents Åland on the Nordic Council, and has long been both an MP and a minister in Åland’s government. She has also represented Åland on the European Committee of the Regions and has fought well in a few EU parliamentary elections. She holds up entrepreneurship as an Ålandic speciality. The ratio of small companies to the number of people living in Åland is very large, Britt Lundberg points out. If you want to stay in Åland you must try to look after yourself, including having your own job. There is an entrepreneurial spirit which benefits exciting companies, even though not all of them are very profitable. In the wake of the latest food and meat scandals, Britt Lundberg wants to promote Åland’s agricultural sector as a safety factor and guarantor for a sustainable development, another Nordic hobbyhorse. The picture of Britt Lundberg is taken outside the Finnish parliament's new addition in Helsinki. It is called "The Small Parliament" and was inaugurated in 2004. Both parliamentarians and civil servants work in the building. The artwork was selected after the biggest competition in Finland's history. The winning artworks were placed both inside and outside the building.